Given the fragility of brand reputation, organizations work hard to build their name as well as to build and to maintain their brand. Those who are the most successful in maintaining their brands get the most market recognition and consumer trust. Companies such as high-end electronics manufactures, luxury apparel, automotive or top-notch consulting firms get to capitalize on their brand and apply high markups to their goods and services as they have proven to be the best over the years. When it comes to brand management, supply chain or service disruptions are par for the course. Disruptions, both preventable and unforeseen can come from various sources such as natural disaster, a cyber security event from a poorly vetted third party, fines or compliance violations from failures in corporate governance, or the bankruptcy of a critical vendor or supplier that disrupts an entire supply chain. Hence, the question that keeps senior executives up at night is how to address reputational risk and ensure brand resilience in financially feasible way? Unfortunately, there is no silver bullet that would solve all our problems as it relates to brand risk management, however there’s one approach that can help organizations address brand risk and it is called Integrated Risk Management (IRM). 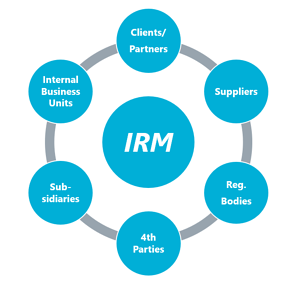 IRM is a holistic approach to risk management across suppliers, clients, partners, subsidiaries, internal business units or departments as well as requirements from regulatory bodies. By employing IRM approach to risk management, organizations naturally move towards more resilient brand and safer organizational environment. Where to start? If it’s not apparent, holistic risk management requires the collection, processing, and correlation of potentially vast amounts of data. If you expect to be successful, it’s also requires the ability to support the uniqueness of your business operations, methodologies, and sources of information. This year Rsam has been named a visionary on Gartner’s 2018 Magic Quadrant for IRM Solutions. Although our position in the report is a great validation of Rsam’s product, our strategy extends beyond providing innovative software and includes partnering with reputable providers that enhance our customers’ ability to more effectively manage risk. The relationship between Rsam and RapidRatings is a great example – by incorporating RapidRatings’ Financial Health Ratings for public and private companies into Rsam’s IRM platform our mutual clients are able to take a 360 degree view of their risk posture and move towards a more integrated risk management state of operations. RapidRatings challenges companies around the world to understand the financial health of their third-party partners by building relationships founded on new standards of transparency. Today’s global leaders, many with highly recognized brands struggle to balance their growing reliance on third-parties and the risks they pose to the company. While third-parties help businesses innovate, disrupt industries, and bring products to market faster than the competition, they are also an extension of their business and brand, which makes strong supplier performance a pre-requisite for achieving business goals. Companies that shift to a more strategic mindset in working with third-parties, much like working with business partners (customers, JV partners, etc. ), grow into more focused, nimble, and cost-effective global competitors. While there is a myriad of key performance indicators to help monitor relationships, financial health is not only the gateway to understanding a company’s underlying strengths and weaknesses, but also a key indicator for other areas of performance, such as time deliveries, product quality and business continuity. Evaluating financial health of third parties, not only at the onboarding stage, but continuously throughout the entire relationship is important to understanding the risk the relationship poses to the organization in meeting stated objectives. In conclusion, risk management should be a prioritized initiative, backed by executives and endorsed across the organization. The effort of building and maintaining a strong and resilient brand does not belong to a single business unit or a department, in fact it is a cross-functional effort where organization should align stakeholder incentives based on collaboration and holistic risk management approach while seeking accurate, non-bias and fact-based opinions to properly assign criticality to all parties involved. Whether your primary goal is to manage third party relationships, prevent disruptions, or protect your bottom line - transparency is key.